PLOT SUMMARY: Following the horrific night where she and her three friends attempted to exorcise a demon from a classmate, Sofia is traumatized, terrified, and ready for a change. She gets her chance when the sudden death of her mother leads to her being shipped off to a Catholic boarding school for troubled teens. The school is strict, repressive, and claustrophobic, but slowly, Sofia gets her bearings, befriending her new roommates and starting work on the school play. But bad things always seem to happen when Sofia's around -- bad things that, deep down, she almost wanted to happen. Is there really evil lurking inside of Sofia? And was what she saw that awful night truly real? DISCLAIMER - THIS REVIEW WILL CONTAIN SPOILERS FOR THE FIRST BOOK. READ THE FIRST BOOK FIRST, MOSTLY BECAUSE IT'S GREAT, BUT ALSO BECAUSE I AM ABOUT TO SPOIL ALL OF IT. OKAY? OKAY. 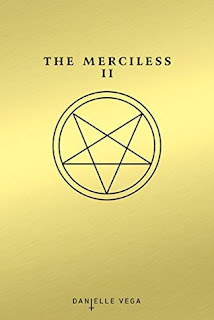 FIRST THOUGHTS: OK, so as mentioned elsewhere on this blog, I adored the first book in "The Merciless" series. So I was really excited to pick up the sequel. As a book, "The Merciless II" was okay, maybe even good, but as a sequel, it was a bit of a letdown. Far from the worst sequel I've ever read, but after being so hyped to continue on with the series, this book just didn't deliver. It took the issues I had with the first book and made them more prominent, and thus harder to look past. (I'll go more into detail below.) It's not bad by any means - Danielle Vega's still a very talented author, and I'm still invested in this world she's created. But it's not what I was hoping for. THOUGHTS ON PLOT: Remember how I said the first book was a slow build, taking its time to set the stage before the real horror began? Well, this book did that, but by a million, and to not-so-awesome effect. Whereas the first book kicked into high gear about a quarter of the way in, this book took about 80% of the way to get there. The pre-excitement stuff isn't bad, but it felt more like waiting for the real plot to begin. Once the excitement did start, it moved incredibly quickly, and was extremely tense -- exactly as a horror novel should be. I just wish it hadn't taken so long to get there. I'm also not too wild about the twist ending. The last book ended with Brooklyn telling Sofia that, as a demon, "we don't harm our own." While that twist was insane, and I was worried about how it'd be handled, it made sense for the story, and was foreshadowed. The twist at the end of this book felt more like drama for drama's sake. I hope the next book proves me wrong. THOUGHTS ON CHARACTERS: In terms of characters, there were some... missed opportunities, to say the least. Sofia is still wonderful as a protagonist, and I still really liked her and rooted for her, even as she had less than sympathetic thoughts and moments over the course of the story. She's definitely flawed, but not irredeemable, and deeply sympathetic. Sofia's roommates are fun and interesting in their own way, but neither of them have the same character depth as Sofia, and feel more like plot devices than anything. Sofia's love interest Jude, however, was a pleasant surprise -- and sometimes, a not-so-pleasant one. (Read the book, and you'll see what I mean.) He was way more interesting than Sofia's crush from the last book, and actually had a purpose in the plot, which is always nice. What really disappointed me the most, however, was Brooklyn's role in this book. In the last book, Brooklyn was my favorite character. In this book, however, she didn't get much to do, and was surprisingly lacking when she did show up, which is a disappointment considering the last book set her up as the main antagonist. She's actually more threatening when she's not there, but Sofia still feels her presence. When she is in the scene, she feels a little too cartoony for my liking, lacking the realism and subtlety that made Riley so terrifying in the last book. THOUGHTS ON WRITING STYLE: I don't have much to add on this section from my last review. Danielle Vega is still a very talented, very skilled atmospheric writer, and I still really enjoy her dialogue and descriptions. As slow-paced as the plot was, it was still a very easy, fast read (two sittings for me), and the bouts of genuine horror in this book were very well-written. I just wish there'd been more of that, and less build-up. FINAL THOUGHTS: While I ultimately found this to be a bit of a letdown when compared to the first book, I still enjoyed "The Merciless II." I think it added to the atmosphere and it definitely set the stage for the next book. Unfortunately, it felt more like an intermission between the first book and the third one, instead of a fully complete story in its own right. I still fully intend to read the third book in the series, which is set to come out this summer. Here's hoping "The Merciless III" picks up the slack! Thank you so much for reading this book review! If you liked this review and would like to get a say in what I read next, consider becoming one of my Patrons! Patrons not only get to vote on what books I read, but also get exclusive access to extra content. My Patreon page is HERE. Thank you so much for your time.